DPP’s are about to hit next week, finding decent Rookie downgrades at DEF & FWD position is proving to be difficult, early cash generation is proving to be difficult for expendable players & a 2 week suspension hit a highly owned player creating issues in the forward line for fantasy coaches this week. Round 4 was the first time Rory Laird recorded more than 5 Marks for a game this season, he recorded a season high 115pts. Lachie Neale has recorded 40 Disposals or more in his last 3 games, he has recorded 10 career games of 40 Disposals or more (7.2%). Patrick Cripps is averaging 30.5 Disposals this season, his previous career season high average was 29.6 Disposals last season. Brodie Grundy recorded a career high 58 Hit Outs in Round 4, he is averaging 128.7pts from his last 3 games. Devon Smith has recorded 100pts or more in 1 game this season & is averaging 89.8pts, this time last season he was averaging 92.3pts & finished with a season average of 106.6pts. Rory Lobb has averaged 64.0pts with Sean Darcy & 93.0pts without Sean Darcy this season. Tim Kelly recorded his 3rd career lowest score of 58pts in Round 4, it was the first time he recorded fewer than 10 Disposals in a game. Brayden Fiorini has scored 100pts or more in 3 of 4 games this season, he is averaging 105.3pts. In his first 2 games of the season Josh Kelly is averaging 107.0pts, he has a career season high average of 113.9pts (2017, Incl Finals). Ricky Henderson has averaged 108.0pts from his last 3 games, he is averaging 102.8pts this season & has a career season high average of 87.3pts (2017). Clayton Oliver has averaged 106.7pts from his last 3 games, he scored 120pts or more in 32.0% of games last season. Todd Goldstein is yet to recorded a 100pt game this season (Ave: 81.5pts), he averaged 83.9pts pre-Bye last season (Rounds 1-12) & 104.7pts post-Bye (Rounds 14-23). Travis Boak has scored 100pts or more in each game this season & is averaging 127.3pts, he has never averaged 100pts or more in a season. Jack Ross recorded 25 Disposals on debut for 86pts, he recorded 16 Disposals in the first half. Jack Billings is averaging 30.5 Disposals this season, his previous season high average was 23.1 Disposals in 2017. Isaac Heeney averaged 71.5pts from his first 2 games of the season, he has averaged 113.0pts from his last 2 games. Dom Sheed has averaged 119.5 without Andrew Gaff & 79.0pts with Andrew Gaff this season. Marcus Bontempelli is averaging 31.3 Disposals this season for an average of 121.0pts, he has never averaged more than 25.0 Disposals in a single season over his career. 1.GWS have recorded an average of +67.0 Disposals against their opponents from 3 winning games this season, the Giants play Fremantle (Manuka) & Sydney (SCG) in the next 2 weeks. 2.Adelaide recorded 440 Disposals in Round 1, each week thereafter the Crows have regressed & are averaging 385.3 Disposals for the season. 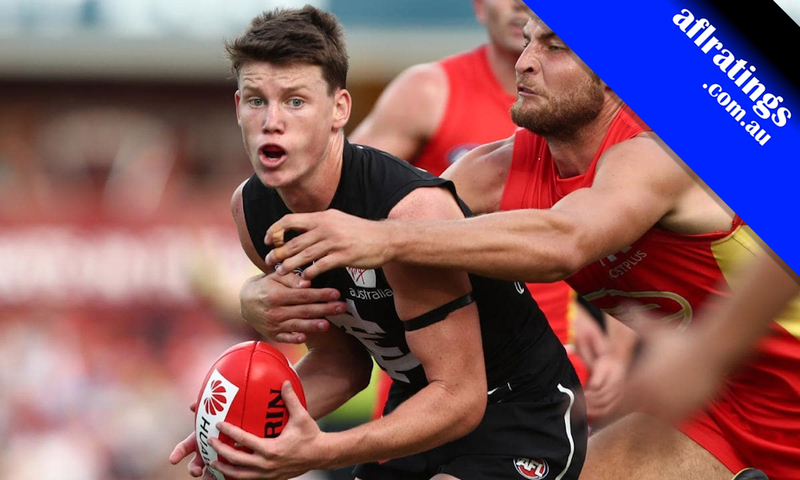 3.Sam Walsh is averaging 26.3 Disposals in his first 4 games of his career (AFL Rank 37), other players that are averaging 26.3 Disposals this season: Rory Laird & Zach Merrett. 4.West Coast have conceded 30 Disposals or more to 2 players this season (R2: Lachie Whitfield 33, R4: David Mundy 36), Eagles play Port Adelaide (Optus) & Geelong (GMHBA) in the next 2 weeks. 5.Jarrod Witts is averaging 44.0 Hit Outs this season (AFL Rank 1), Max Gawn 43.0 Hit Outs (Rank 2) & Brodie Grundy 39.8 Hit Outs (Rank 3). Warnie, Cal & Roy discuss these takeaways on the Traders Podcast (10:14). Its also a flip of the coin for what one to keep. Just wait until team selection and then maybe base it on BE. Setterfield to Ross is a given trade 100%. I would also do trade 2 as well because having Parker or Burgess on your field now may cough up 40 points a week (I’m in same boat). Billings also is playing through midfield compared to forward line in previous years so hopefully won’t burn you (or me). cheers, yes makes sense, i guess i just liked having 430k sitting there but no good doing nothing i guess and that move means parker/burgess not on field and Worpel to F5 looks good. Who to bring in out of J.Worpel, R.Marshall or J.Newnes ? ?